West Virginia University needed selective demolition and asbestos abatement for Brooks Hall, the 140,000-square-foot, five-story classroom and laboratory building that would be converted into the university's new geography building. A project challenge was loading out architectural finishes and environmental concerns without disrupting the critical utility services that passed through Brooks Hall to the rest of the campus. To keep Brooks Hall and its services operational, we constructed innovative load outs to move 13,000 cubic yards of debris. 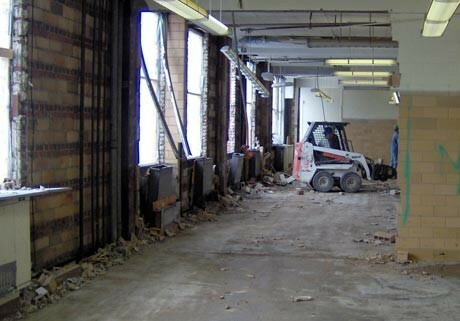 We utilized a Lull-style forklift to remove debris from the upper floors. For the first floor, we converted an exit point to a large load-out area where debris was separated for recycling into multiple dumpsters at once. The load-out for debris in basement required coordination between the rigging area and the operator of a 30 ton crane through radio contact due to a retaining wall that interfered with the operator sight of the landing area. The work of the job involved many disciplines. Precision supervisory group led the effort of coordinating the local subcontractors hired to perform the cutting and relocating of utilities. We kept a constant communication program including all contractors, university personnel, architects, and environmental consultants. That helped facilitate all work being successfully completed within the 100 day project schedule. Selective demolition and asbestos abatement for Brooks Hall, a 140,000-square-foot, five-story classroom and laboratory building. © 2019 Precision Environmental. Some rights reserved. Terms & Conditions.